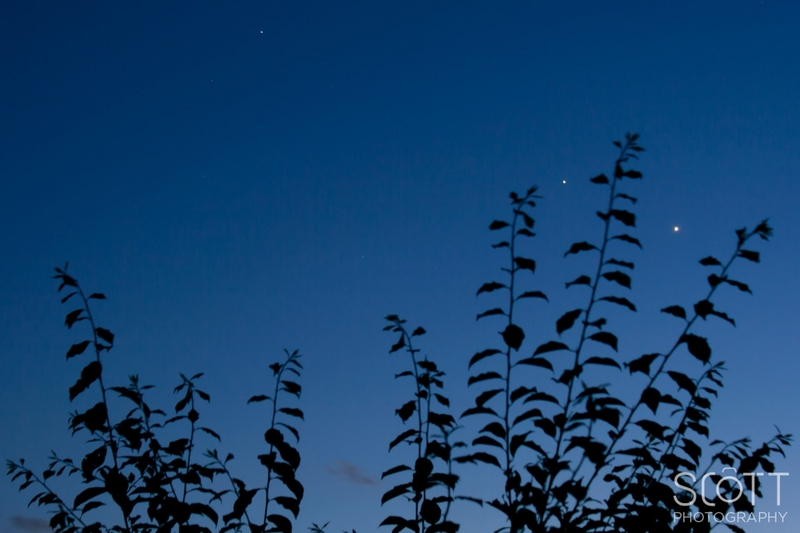 If you’re in North America, Jupiter and Venus are closest on June 30th at 11:00 PM EDT. If you’re me, you’ll look west after sunset on both days to try and see the conjunction. The two planets will be close enough in the sky that you’ll be able to stick your pinkie finger out at arms length and block both of them. As for this particular conjunction, this is the closest that Jupiter and Venus will be in the night sky until August of 2016. I took this photo on June 24th right after the sunset. Besides Jupiter and Venus, Regulus was also visible and you can see it near the top-center of the photo. A tree from my neighbors yard sits in the foreground. One of the things that I really like about this photo is the fact that there is not a lot of context for tree in the foreground. This leaves the finer details to the viewer. Is the tree 10′ tall? Is it 100′ tall? Was the photo taken at ground level? This entry was posted in Long Exposure, Nature, Space and tagged in Jupiter, Venus. « Who is Mr. Robot?